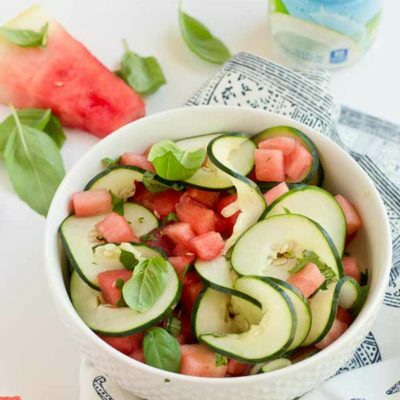 This Watermelon Cucumber Salad is all about fresh summer produce and just 5 ingredients. 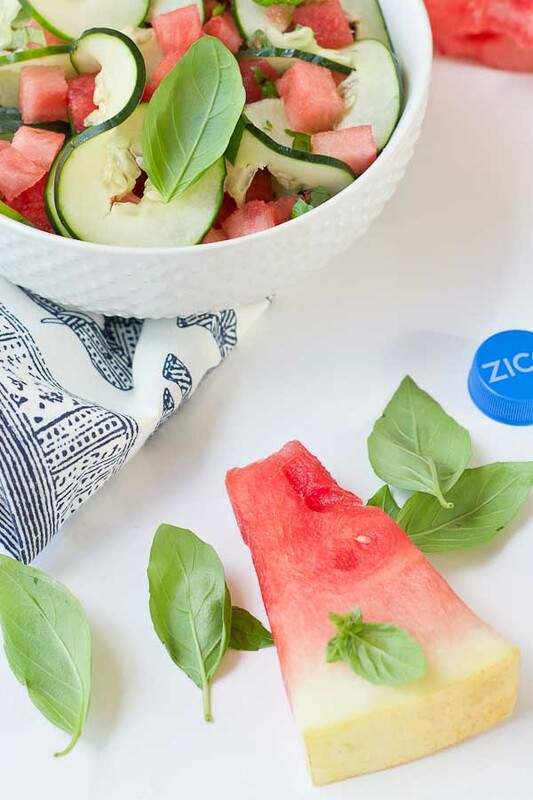 Watermelon, cucumber, basil and coconut water will hydrate and make you feel refreshed from the inside out. Thanks to ZICO Coconut Water for sponsoring this post. Something about freshly cut watermelon infused with cucumber, basil and coconut water makes my mouth water like CRAAAAAZZZY… I just can’t sleep… I’m so excited I’m in too deep. Oh you know you know all the lyrics to that old Britney song. Any closet Britney Spears fans in the house? I was more of boy band N’Sync/Hanson fan back in the day, but I still can sing all the 90s pop songs with the best of them. Focus. I know y’all are here for the Watermelon Cucumber Salad. Watermelon has been so good lately, like can’t-stop-won’t-stop-eating good watermelon. And for the love of basil it is taking over my garden this summer, not like I mind because basil is so fresh and lovely. Since it’s so HOT outside, a refreshing fruit salad can sure help to beat the summer heat. 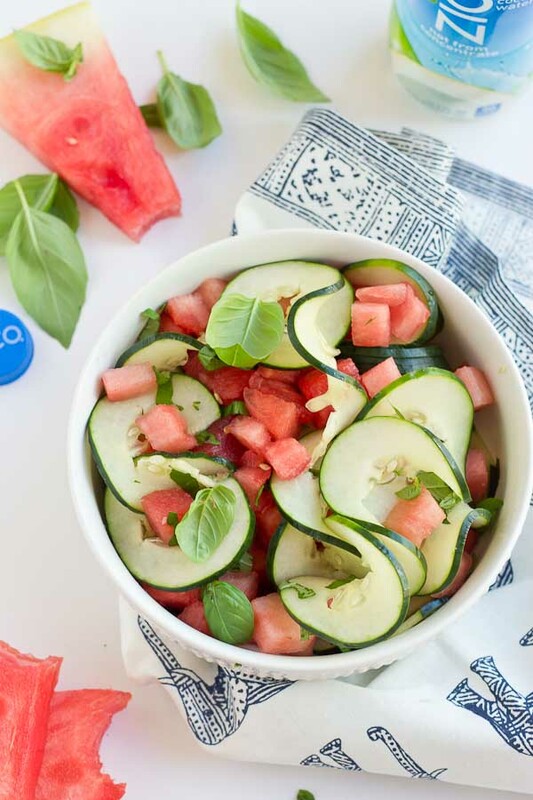 This Watermelon Cucumber Salad is packed with 3 hydrating foods—watermelon, cucumber, and coconut water! I love ZICO 100% Coconut Water because it doesn’t contain any added sugar and it’s not from concentrate. Coconut water is packed with 5 electrolytes for hydration and has just as much potassium as a banana! 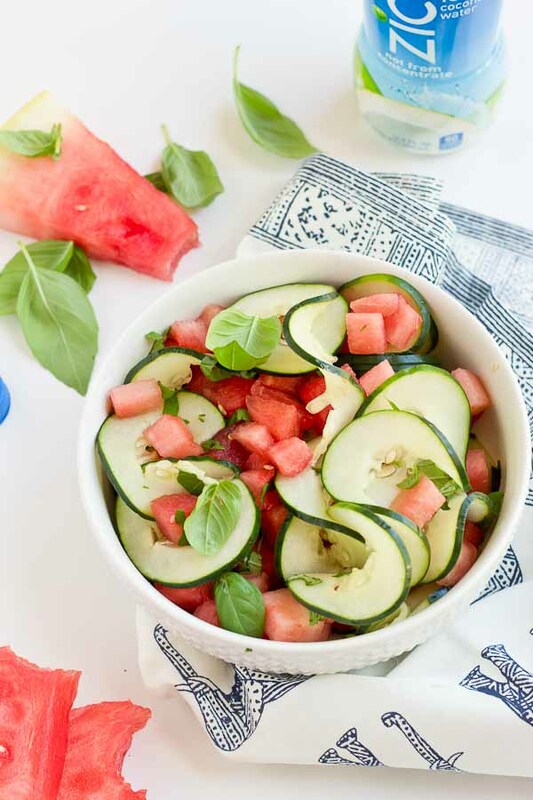 Watermelon Cucumber Salad needs to happen ASAP. That’s right. 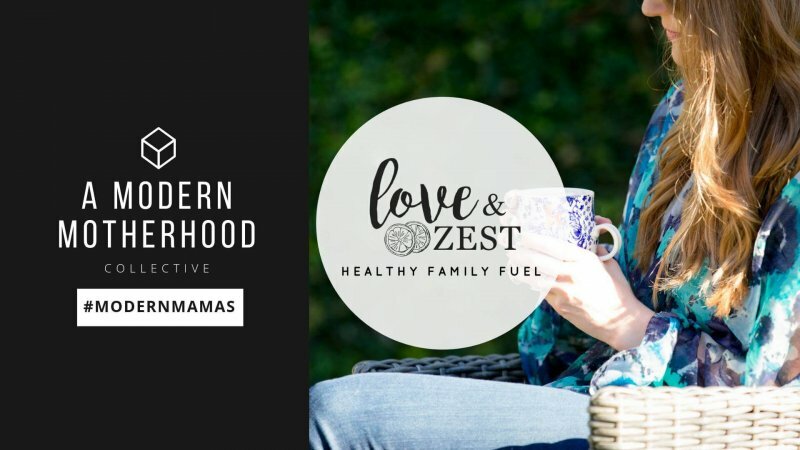 Because we all want to stay hydrated and eating yummy food is for sure the tastiest way to hydrate. 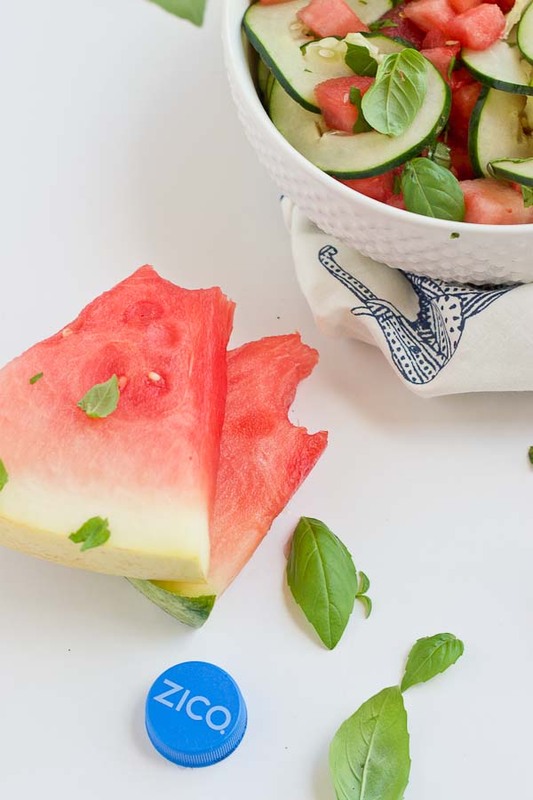 This Watermelon Cucumber Salad is all about fresh summer and just 5 ingredients. 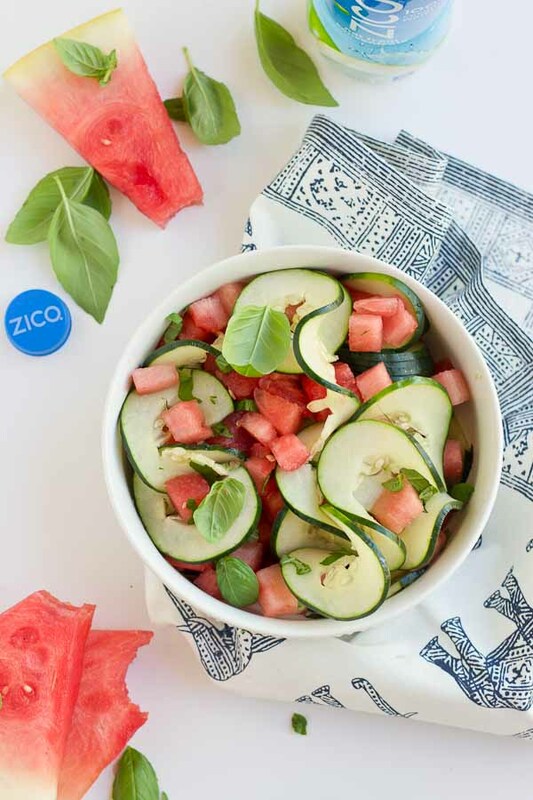 Watermelon, cucumber, basil and coconut water will hydrate and make you feel refreshed from the inside out. 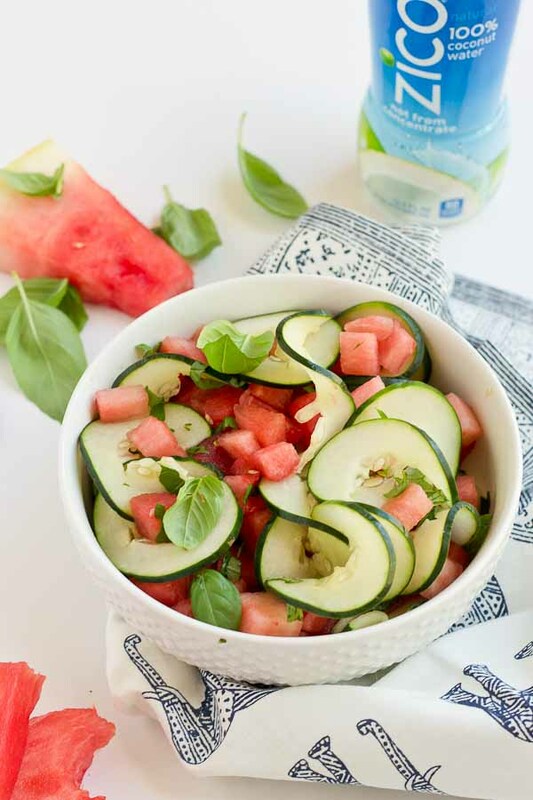 In large bowl, toss together watermelon, cucumber, basil, coconut water, honey and sea salt. This is such a creative way to use that coconut water! What a light and refreshing salad- absolutely perfect for summer!